WASHINGTON -- If you call Sen. Barbara Boxer's (D-Calif.) Washington office these days, you won't be greeted by a cheery staff assistant. Instead, you'll get this recorded outgoing message. "Hello, this is Sen. Barbara Boxer, and I want to thank you so much for calling my office," the message says. "As you probably know, we're in the midst of an outrageous government shutdown that is hurting our country. This shutdown would end immediately if Congress enacted a clean budget without adding unrelated controversial measures. I want you to know that I'm doing everything in my power to reopen the government, so that it can once again fully serve the people." Although members of Congress are still getting paid during the shutdown, many members of their staff have been furloughed. And with fewer aides to answer phones, lawmakers have resorted to recorded messages. Some are even working shifts answering the phones themselves. "Let 'em rip baby!" Sen. Joe Manchin (D-W.Va.) said as he sat down at the front desk of his D.C. office to answer phones on Wednesday. The Associated Press noted that his office has gone from 27 to 11 staffers during the shutdown. Hello, you've reached the office of Congressman Rob Bishop. Due to the government shutdown and most of our office staff being furloughed, we are unable to answer your call at this time. Please feel free to leave a message. As Congressman Bishop is in the office working, and an available staffer will be checking messages frequently throughout the day. You should also feel free to contact the Senate and Sen. Harry Reid's office, in particular, to encourage him to negotiate on any of the versions of the spending bill that the House has sent over in order to end the shutdown. Thank you. 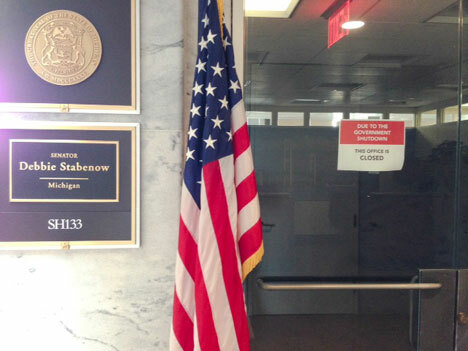 Stabenow spokesman Cullen Schwarz, who is still on the job, said there are still a few people working in the office, but there is no one at the front desk. Due to the lapse of appropriated funds at midnight September 30, 2013, normal operations of the United States Government are suspended until funding is restored. Effective Tuesday, October 1, 2013, I have been placed in a temporary, non-duty, non-pay status until such time as funding is restored. As a result, I will not be allowed to report to work, check emails or respond to your message for the duration of the "shutdown." I will respond to your message in turn, as soon as the "shutdown" ceases. Thank you for your message. Due to the Federal government shutdown I have been furloughed. By law, I am unable to perform any work activities and cannot reply to your email. I will not be able to respond to your message until after the Federal government reopens. I am out of the office today due to the federal government shutdown. However, our office will proceed with constituent meetings as scheduled. Several Republican offices, however, have not furloughed anyone. Send any email, phone or other away messages you see from furloughed government workers to HuffPost here. Please put "Shutdown Message" in your subject line.